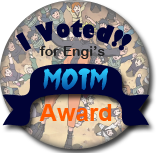 13 years of engi: A wonderful engiversary - Engi no Jutsu - The Best Naruto RP on the Net! A favourite part of Engi? Goodness that's a tough one, there's so many things over the years that have made Engi as amazing as it is. I think though, I have to go with what is often a popular answer: the Community of Engi is my favourite part of it. When I first joined, I was, to put it mildly, not a social butterfly. My school had the idea that if they gave us so much homework as to tie up our afternoons and evenings so entirely that we never had any free time, then there'd be no complaints about mischievous children running around annoying neighbours or townsfolk, caring little about how it socially stunted us. And so, and 11pm at night when I had finally done the days workload I turned to the internet to find some shred of the social contact I lacked, and found this place. And I mean it literally when I say everyone here was lovely. No one minded I was young and stupid compared to most other members, and most amazingly no one looked down on me for it either. Everyone encouraged and supported each other, both with the forum itself, and with life issues that would often get brought up in chat. And being exposed to such a wide range of people of all different ages, places, and cultures, lots from places that at such a young age I wasn't even aware of yet, I think probably made me into a much more open minded and accepting person than I would have been otherwise, even if I had been able to go out and socialise in my quiet little town. The best example of this was seeing a couple of members, who's home countries absolutely hated each other, playing and talking together as fast friends, united by being part of this little online community. It warmed my heart then, and is still an idea that gives me hope today as the world becomes more and more divisive on the surface, that I know and have seen for myself that people really just want to get along and enjoy themselves, and that its entirely possible for it to happen. And that's why, I think, people like to come back and check in every so often. And why so many of the stories and adventures written on this site were so memorable and joyous to do. Plots, narratives, and ideas all fuelled, inspired by, and reflecting all the different backgrounds, personalities, personal struggles and triumphs the melting pot of the Engi community had been through, all combining to make something every single person could enjoy together. So you go, Engi. Keep being you. I have to say my favourite part of Engi is coming on every few years and creating a new character, I just love the system and the options and to see what new techniques/clans are available. For me there is something special in creating something new. Claiming the 7 AP as well. I just like the fact that I have probably 40 dead or deleted characters. It's a pure source of inspiration for my real life writing. I always have a fully fleshed out character because I created the ninja version of it already. Speaking of old fogies resurrecting, whenever I do pop back up, I seem to find myself around this time of year. Found myself at a con recently, a few friends like to cosplay people from Naruto, felt a little nostalgic, especially since I haven't been able to write anything in a while. Working in a bar ain't the easiest on the mind and body. Welp, let's see to sticking around longer this time. For better more than worse. Love you guys, even compless, stoned and unreliable, I always feel I have a group of friends hidden away. I am glad you all are my secret society. I hope we're around forever just to satisfy old wandering souls who have an untapped desire to pretend to be ninjas! 7AP because why not keep making Fist ridiculous. I have to say that I love absolutely everything about the site. I think we have the best set-up, the best rules, the best graphics, and the best community out there. I want to thank everyone who keeps Engi running so that people like me can come back to it after a few years and still find the same enjoyment I had from the beginning. So engi is a teenager now. Damn the years go by fast. I still think of it fondly and often. We should arrpee. Happy birthday, Engi! I am back in you!